Thomas A. Jandro, age 78, of Faribault, passed away unexpectedly on Friday, May 11, 2018 at his home. Memorial services will be held on Thursday, May 17, 2018, at 11:00 a.m. at the River Valley Church, 722 Ravine Street, Faribault. Memorial visitation will be held on Wednesday from 4:00 - 7:00 p.m. at the new location of Parker Kohl Funeral Home, 1725 Lyndale Ave. N., Faribault and on Thursday for one hour prior to the services at the church. Tom was born on October 26, 1939 in Faribault to Felix and Mary (Mahoney) Jandro. 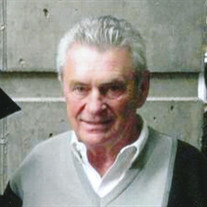 He graduated from Bethlehem Academy High School with the class of 1958. On June 18, 1960 he was joined in marriage to Gail Kispert. Tom received training in office equipment repair at Faribault Vo-Tech and worked in Minneapolis for BMS before purchasing the company. In order to spend more time with his family, Tom started Jandro Office Products in Faribault and operated the business with Gail for over 30 years. Tom loved his wife, children and grandchildren more than anything. While family was his first love, you may have seen him driving around town with his best buddy Coco Bear, showing that dogs really can be man's best friend. He spent time golfing, buying and selling old cars and playing cards with friends. He is a man with a generous heart and always willing to give to those in need. In all that he did his desire was to be a friend to others and share his love for Jesus, his savior and strength. He is survived by his wife, Gail Jandro; children, Jeffrey Jandro, Michelle (Randy) Creasman, and Renee (Terry) Knoploh; grandchildren, Jessica (Chris) Matakis, Katelyn (Jared) Holton, and Kelsey Knoploh; sisters-in-law, Karen Schweisthal and Carolyn Kispert; brother-in-law, Carl (Mary) Kispert; and many other relatives and friends. He was preceded in death by his parents, Felix and Mary; brothers, Hilary, Louis, Eugene, and Donald Jandro; and sisters, Margaret Weinand, and Lucille Bauer; father and mother-in-law, Harleigh and Grace Kispert; brother and sisters-in-law; and nieces and nephews.